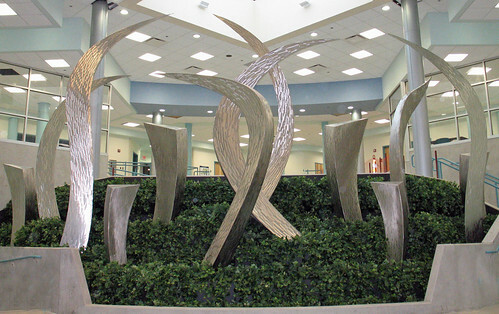 Atlantis Sculpture at Summit Behavorial Center - We Help! In 2006 Rubenstein Studios chose our company as the Cincinnati movers for their “Atlantis” sculpture. One of our movers mentioned how much fun that was and that we should post a picture of it. The Atlantis project was commissioned by Summit Behavioral Center here in Cincinnati. With months of work behind him, Barton Rubenstein finished his his sculpture and loaded it into two different rental trucks. After traveling more than 500 miles the 13 pieces of stainless steel arrived in Cincinnati. When we opened the trucks they were a web of ropes and supports, hanging in those supports were the beautiful pieces of metal. We carried them into the assembly area one at a time and laid them on soft blankets so the highly polished steel wasn’t blemished. With each piece weighing several hundred pounds it took several of our crew to move each piece.